Nicole + Lisa include a great section titled "Stocking Your Awesome Vegan Pantry", especially useful to new vegans or vegan looking to upgrade their pantries. There is also a section on non dairy staples // ice cream, cheeses + plant based mylks. Along with a section on how to make your favorite store bought snacks + cereals // think toaster pastries, breads + crackers. One of my favorite chapters " Sensational Spreads + Sauces" , making your own sauces, jams + nut butters not only saves you a ton of money but can be a huge time saver, no more last minute runs to the store and often times tastes even better than store bought. Another really cool section is another favorite "Make Your Own Mixes", homemade shake n' bake - YES! Easy instant make + cheese mix, so much awesomeness. I have the opportunity to share with you a recipe from the book. Popcorn, hands down is one of my favorite snacks. 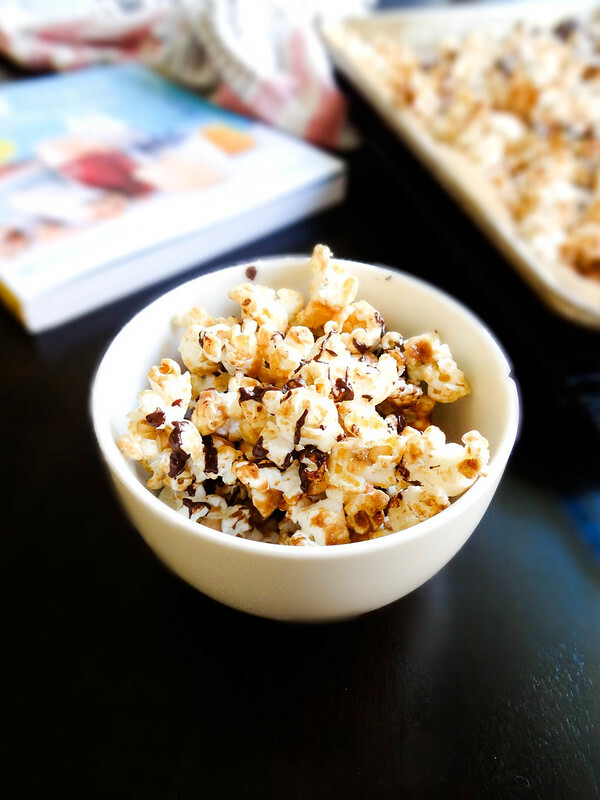 Popcorn covered in peanut butter and chocolate, pure heaven in a bowl. This recipe is incredibly easy to make and comes together in a flash. 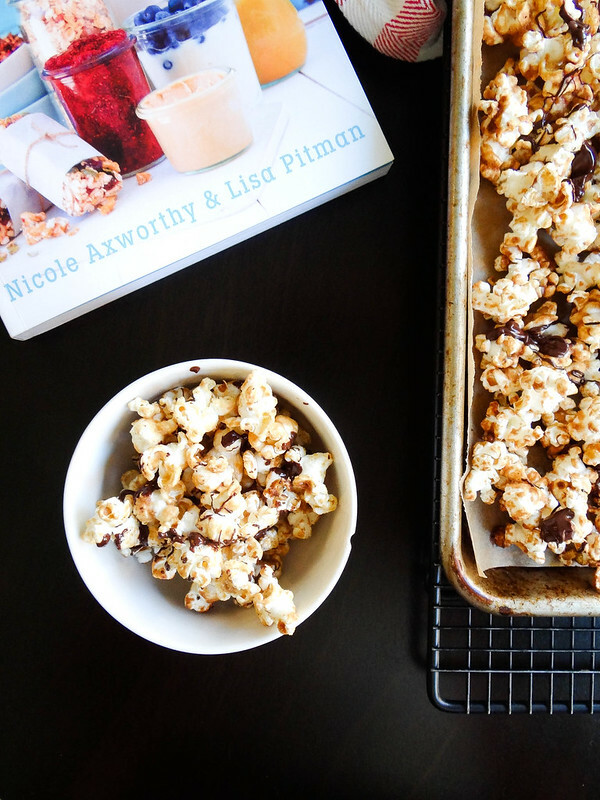 I opted to air pop my corn and use a white chocolate peanut butter. 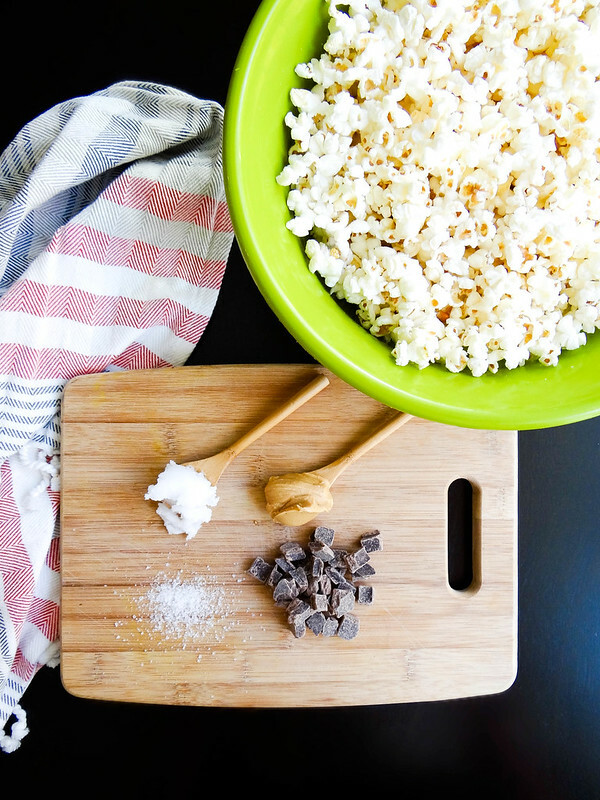 This snack also has the benefit of keeping in an airtight container for up to seven days (fat chance this popcorn will even last that long). It is the perfect snack to serve to a crowd // football Sunday, pre or post Thanksgiving snack or fun after school treat. 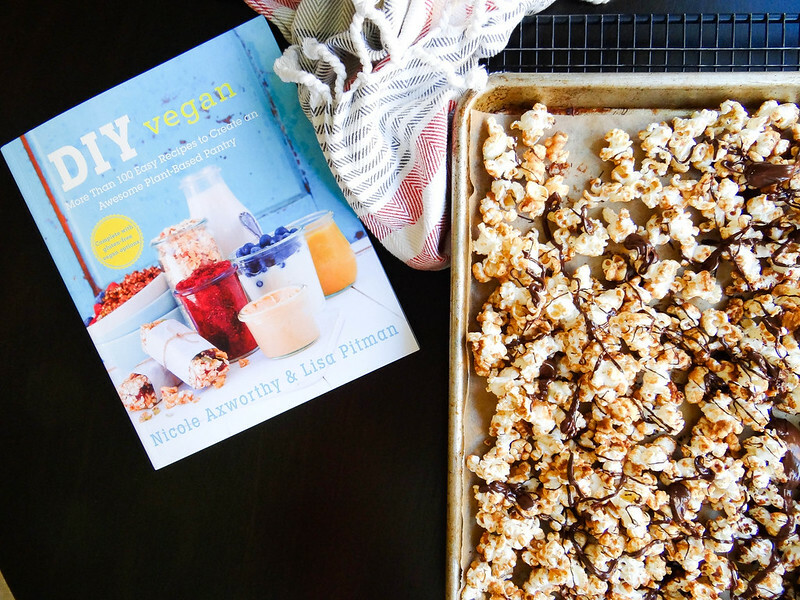 You can find DIY Vegan More than 100 Easy Recipes to Create an Awesome Plant-Based Pantry by Nicole Axworthy + Lisa Pitman on Amazon. With Christmas right around the corner this would make the perfect gift for anyone looking to create a homemade pantry. 1. Preheat the oven to 300 degrees F. Line two baking sheets with parchment paper. 3. In a small saucepan, melt the remaining 2 tablespoons coconut oil, the peanut butter, maple syrup and salt over medium-low heat; stir to combine. Remove from the heat and add the vanilla extract. Drizzle the mixture evenly over the popcorn and stir to coat. 4. Spread the popcorn over the prepared baking sheets. Bake for 15 minutes. 5. 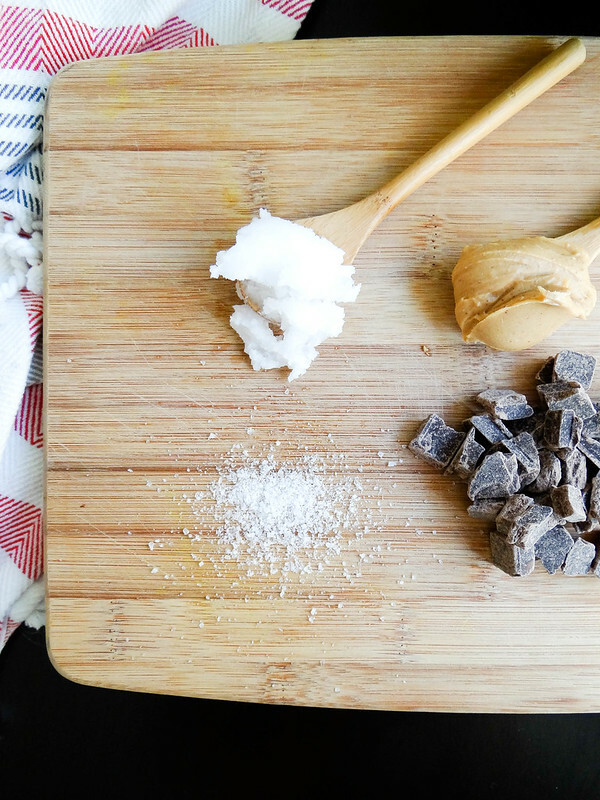 Finely shop the chocolate and melt it using a double boiler. 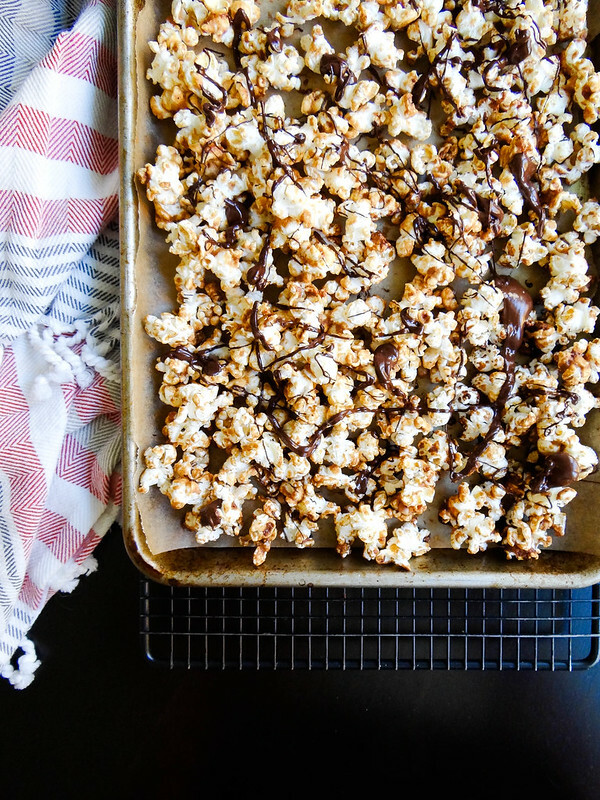 Drizzle the chocolate over the cooling popcorn. Transfer to the fridge to finish cooling, at least 30 minutes. Once completely cool, store in an airtight container at room temp for up to 7 days. 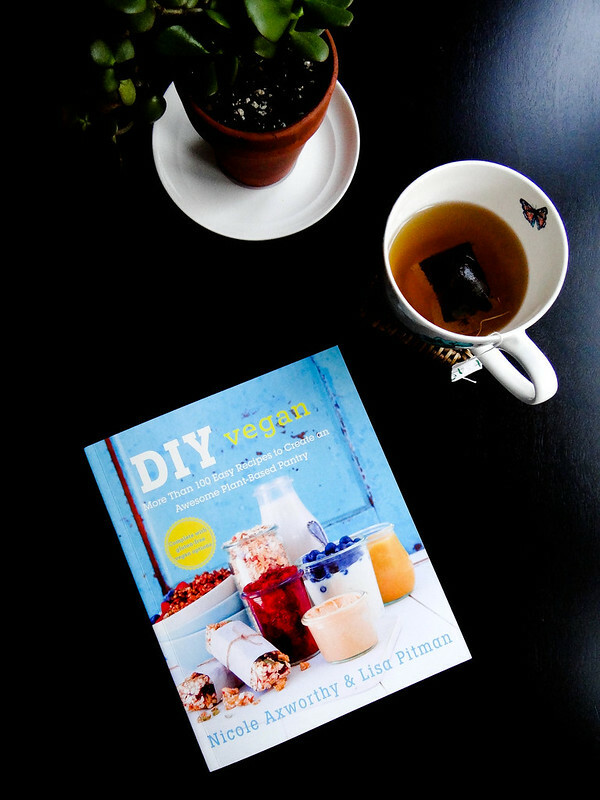 I was provided with a review copy of DIY Vegan, however all thoughts and opinions are my own. Thank you so much for sharing our book with your readers, Heather! I'm thrilled that you're enjoying the recipes. I recommend J Natalie Winch's book Ditching the Drive Thru. Her site for it is http://spikehornpress.com/product/ditching-the-drive-thru/. She discusses farm fresh food options, recipes and some tips on eating as healthy as possible. It's been a mainstay on my bed side table and my kitchen counter! A great addition to any healthy living library! Stop deleting comments! The info about thetruthspy is too important to be ignored! Everybody must know about it! Give me a chance to be represent the site. On the off chance that you get energized by yummy sans dairy vegan formulas, you're going to adore this one. essay writing service. For the smoothest consistency, use cashews or stripped almonds. In view of their soluble nature, almonds help keep your blood at an impartial Ph. You shared a nice recipe and thanks for sharing this. I will try this i will share it with my friends. Techoo is the place where you can get more updated information.